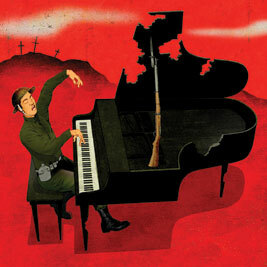 Oh What A Lovely War -a musical throw back to The First World War, highlights the songs of an entire generation … and is playing at the Young Centre for the Performing Arts until April 10. Tickets are $29 and $70 with show dates Monday through Saturday at 7:30 pm and Wednesday and Saturday matinees playing at 1:30. This show had its original debut in 1963, but this week you have the opportunity to win a pair of tickets to the 2010 version directed by Albert Schultz and with musical direction by Marek Norman! Yep, just be the lucky 13th person to contact us here at contests@mooneyontheatre.com quoting the subject line Oh What A Lovely War. Remember you can enter once per day and the winner will be announced on Wednesday. To purchase tickets visit www.soulpepper.ca, www.stageplay.ca or call the box office at 416-866-8666. For more information about the play, read excerpts from the press release below . Toronto, ON – February 9, 2010 – Albert Schultz, Founding Artistic Director of Soulpepper Theatre Company, today announced that the company’s production of Oh What a Lovely War will run March 11 – April 10, 2010, at the Young Centre for the Performing Arts. Featuring the songs that provided a soundtrack to the loss of millions of young lives during the First World War, Oh What a Lovely War celebrates the spirit of a generation while skewering the absurdity and futility of war. “Pack up your troubles in the old kitbag… It’s a long way to Tipperary… Keep the home fi res burning…” This satiric British anti-war musical created by Joan Littlewood, Theatre Workshop and Charles Chilton, was first presented in 1963 and was adapted into a film, Oh! What a Lovely War, which premiered in 1969 and was revived in 1998 for a national tour, following a 35-year hiatus. Albert Schultz directs Oh What a Lovely War with musical direction by Marek Norman, and an ensemble cast featuring Oliver Dennis, Ryan Field, and Founding Member Michael Hanrahan. Making their Soulpepper debut are Alison Jutzi, George Masswohl, Doug Price, and Soulpepper Academy members Ins Choi, Tatjana Cornij, Raquel Duffy, Gregory Prest, Karen Rae, Jason Patrick Rothery and Brendan Wall. Set design is by Academy member Ken MacKenzie, with costume and lighting design by Academy graduate Lorenzo Savoini, choreography by Candace Jennings and sound design by John Lott. Oh What a Lovely War previews March 11, 2010, opens March 17, and runs until April 10 at the Young Centre for the Performing Arts, locatedat 55 Mill Street, Building 49, in the Distillery Historic District. Tickets range from $29 – $70 and are available by calling the Young Centre box offi ce at 416.866.8666 or by visiting www.soulpepper.ca. $20 tickets are available for 21-30 year-olds at www.stageplay.ca. StagePlay is sponsored by TD Bank Financial Group. Sun Life Financial, Scotiabank Group and TELUS. Soulpepper gratefully acknowledges annual operating support from the Canada Council for the Arts, the Ontario Arts Council, and the Toronto Arts Council. Soulpepper Theatre Company is an artist-founded, classical repertory theatre company with a three-tiered mandate: to present the world’s greatest stories in vital Canadian interpretations; to train a new generation of theatre artists; and to inspire and enrich youth through mentorship and access programs.